We believe our customers deserve to be treated with the utmost respect, which includes respecting your right to privacy. We've designed and structured our website so you can visit and browse without identifying yourself or revealing any personal information. The only way for us to obtain any personal information about you is for you to tell us yourself. For example, when you place an order or ask for more information, we may store your name, mailing address, telephone number and/or email address on our secure server. For optimal security, your credit card number is deleted automatically from our secure server immediately after you place your order. To comply with tax laws, we may keep a printed copy of your order on file in our Accounting Department. Cookies allow us to track the contents of your shopping cart. Without them, you'd have to write down each item you wanted to buy then type the information into a manual form to complete your order. Thanks to cookies, ordering is quick and easy. You can browse all of our product pages, click on the items you want to add to your cart, and our system will store them until you're ready to check-out. When you come back to shop the next time, you won't have to re-enter your name and address again. The cookies remember that information for your convenience. For personal security reasons, we must ask you to re-enter your credit card information every time you shop. We don't permit cookies to store that information. Our secure server automatically receives and logs information from your browser including your IP address and information about the page you requested to view. This information tells us which webpages our customers are most interested in, and helps us tailor our website to our customers' wants and needs. From time to time, we may request your participation in an online survey or questionnaire. Your participation is completely voluntary but greatly appreciated, as these provide insight into our customers’ opinions, demographics and satisfaction. We use that information to tailor our products and services to our customers’ preferences and offer website content that matches your interests. If you have ever placed an order with us or requested any information, we have your personal information such as your name, mailing address, telephone number and/or email address on file. We use this information for our own purposes only to share special offers, surveys or questionnaires. Occasionally, we may email you about new products, services or special offers that we think might interest you. We may also email customers for feedback after their shopping experience. Any email message we may send you will always include clear, simple unsubscribe instructions if you choose to permanently delete your email address from our mailing list. 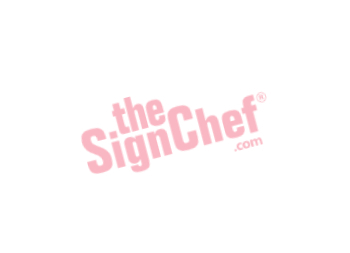 At TheSignChef.com, we have several security measures in place to protect the loss, misuse and alteration of the information we control. These measures include password protection, encryption and our off-line database, which is not accessible via the Internet. We also conduct pre-hire criminal background checks on ALL our employees. For more information on these and other security measures, please see our detailed Security Policy and Guarantee. We will never sell, rent, give, share or otherwise disclose to any third-party any information that you provide to us about you, your business, your website, your methods and your procedures without your knowledge or consent without a subpoena or court order. We're committed to a strict "No Spam" policy. Whenever you receive an email from us, it will contain clear, simple unsubscribe instructions if you choose to permanently delete your email address from our mailing list. Please note: For tax and legal purposes, we are not allowed to destroy paper records of orders placed with us. However, we will comply with ALL requests to remove your information from our email and direct mail lists. We reserve the right to amend this policy as needed and at any time. If we make any substantial changes to the use of your personal information or we are required by law to share your data, we will notify you.